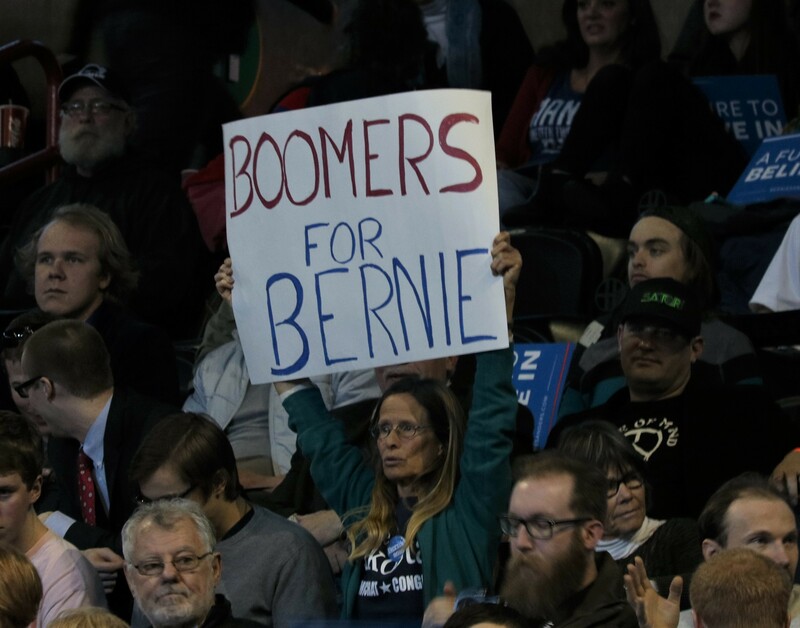 It's only fitting that the lyrics "Burn Baby, Burn" from The Trammps' "Disco Inferno" was blaring over the loud speakers as Bernie Sanders' supporters filed into the Spokane Arena this morning. 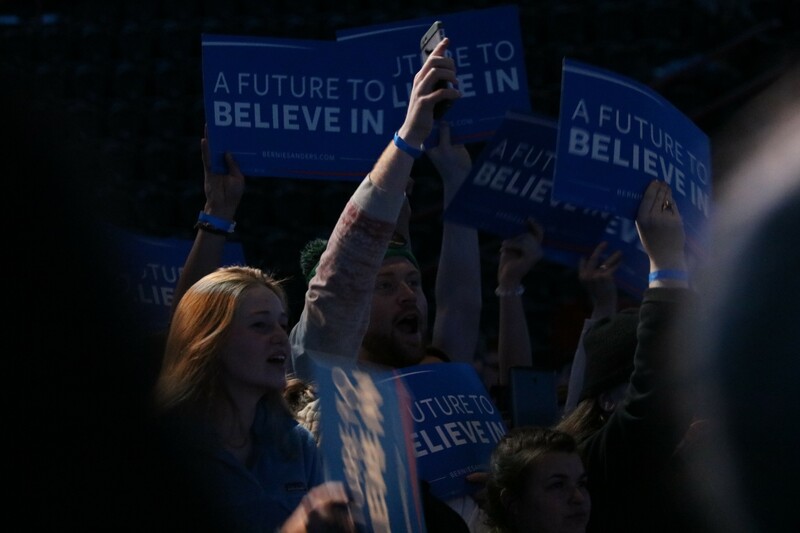 Thousands of supporters came for the second installment of Sanders in Spokane. Sunday's rally attracted more than 9,000 people, only 1,000 of which were actually able to see him speak. This go-round, Sanders filled up about half of the arena, which holds 14,000 people. Once it hit noon, hundreds of supporters had already staked their claim on the floor or in the bleachers surrounding the stage. College students Vanessa Beach and Carlie King had been there since 6 am, even though the arena didn't open its doors until 9. And yes, their signs are homemade. 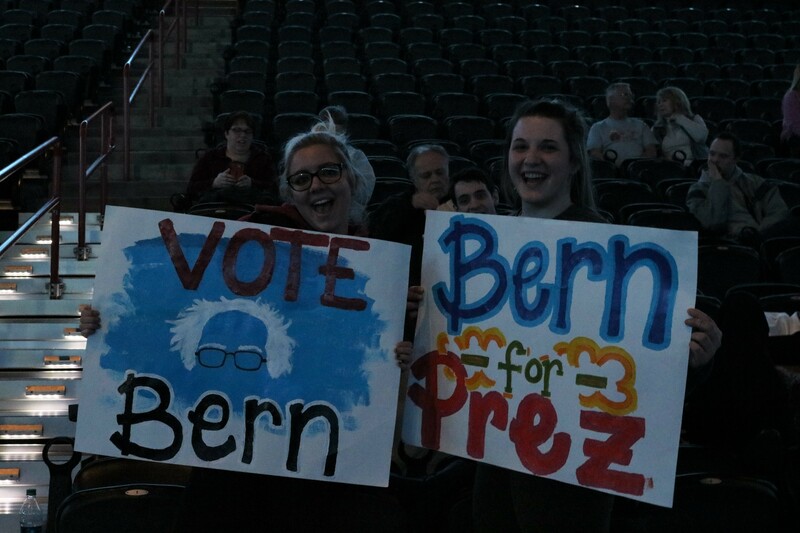 When asked what they liked about Sen. Sanders, college students Carlie King (right) and Vanessa Beach (left) proudly exclaimed "Everything!" King and Beach looked energized and excited despite the early morning they had. King mentioned that although she had to work Sunday and missed the first rally, she was ecstatic to have another chance to see him speak. "I really like that he's bringing all groups of people together," King said. "There's a lot of hateful rhetoric going on out there right now, and I like that he has a positive message. He's very consistent in what he says." But they weren't the only ones with signs in the crowd. 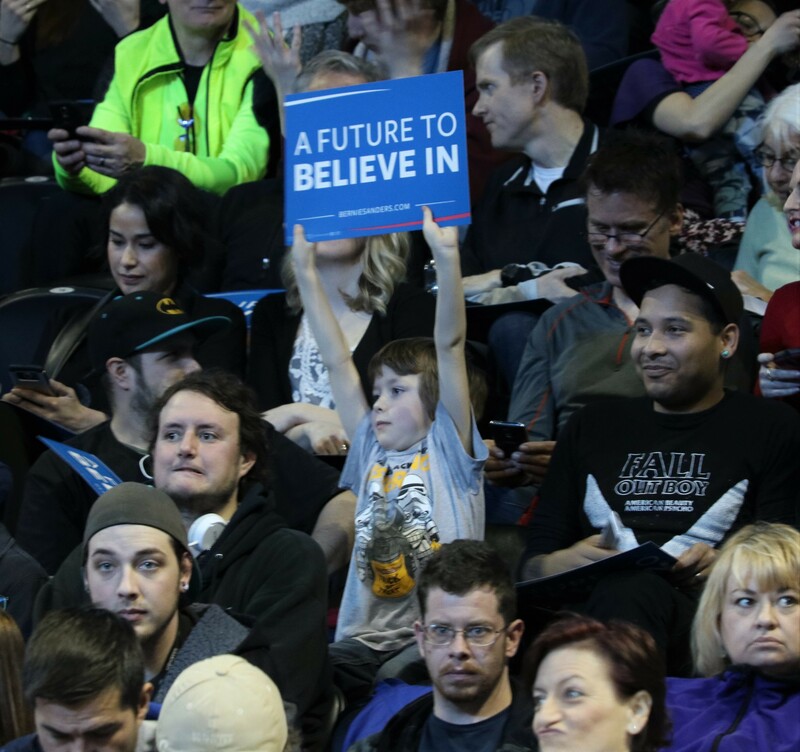 Sanders supporters from all age groups could be seen proudly displaying their signs, homemade or not. 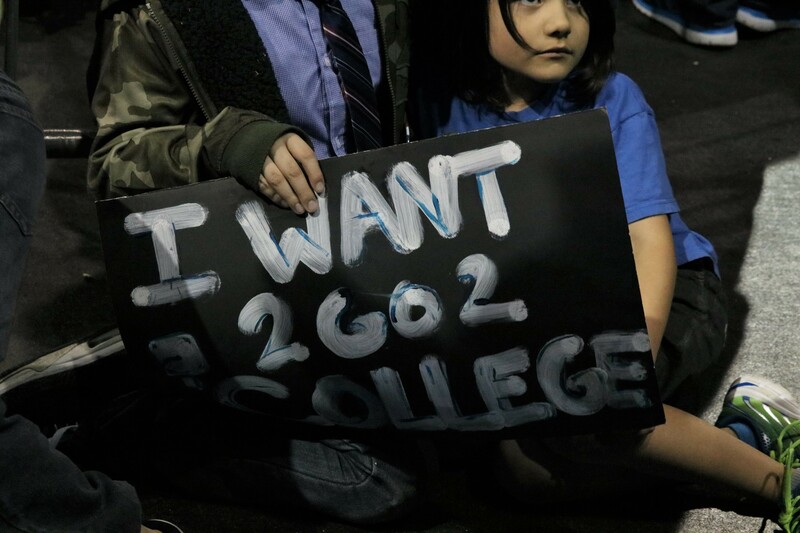 Multiple children clutched signs, some with the hope of catching Sanders' eye, in support of their future education. The event was scheduled to begin at 2 pm, but Sanders made his appearance on stage about 20 minutes late. The crowd was invigorated. Various chants and cheers could be heard from multiple sections in the arena, waiting for Sanders to emerge before he did. 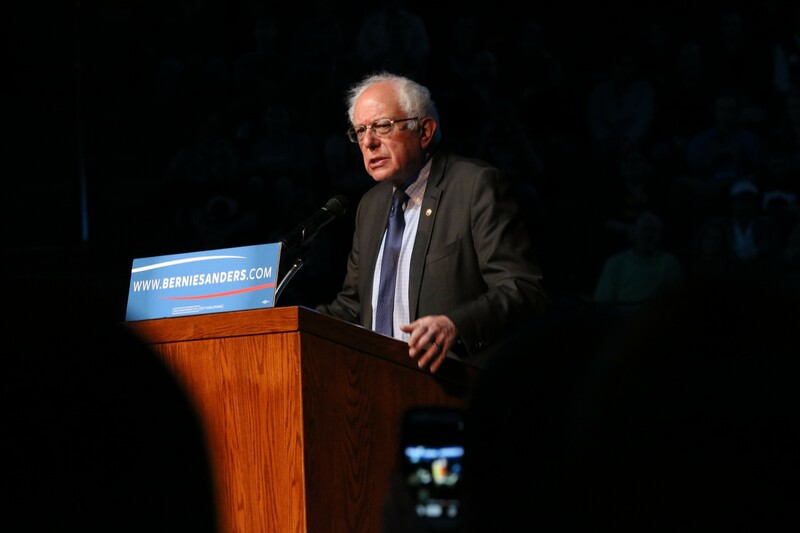 But once he made his first step into the spotlight, Sen. Sanders was greeted by a tremendous roar of applause. As he took the stage, he started by addressing the misinterpretations of his current status in the presidential race. And of course, his qualifications that would help him beat Donald Trump. "If you talk about the issue of which candidate is most able to beat Donald Trump, there really should not be a debate about that," Sanders said. "Poll after poll after poll makes is clear that we do much better against Trump" than any other candidate. He added that although Clinton beat Trump by 12 points in a recent poll, he leads Trump by 20. 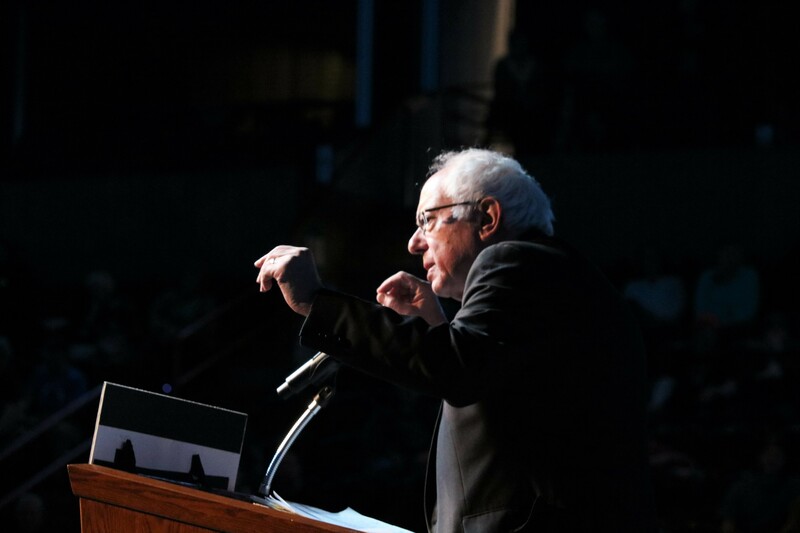 As Sanders began to cycle through his stances on hot button topics such as poverty, Citizens United, healthcare and the criminal justice system, the crowd remained engaged as his voice echoed in the arena. A significant point Sanders made that elicited ear-splitting cheers was his statement about female versus male wages in the job market. Currently, women make 72 cents to every single dollar that men earn. "It is unacceptable," he said. "They want the whole damn dollar!" 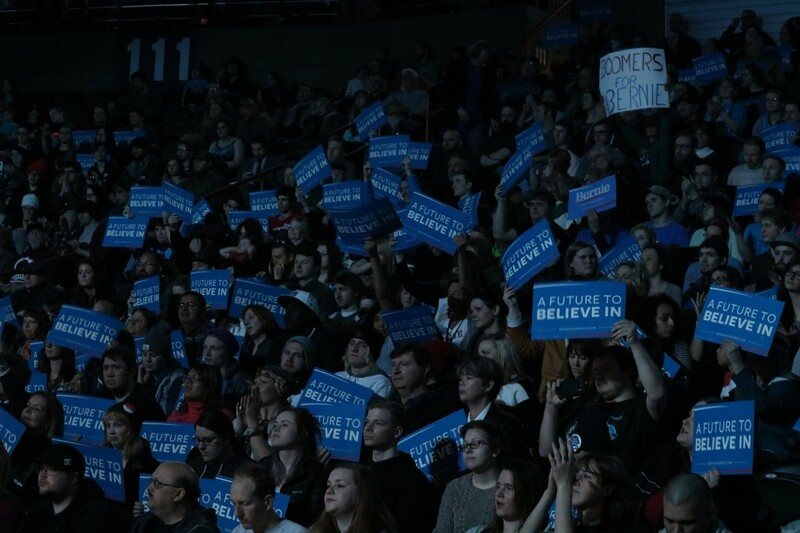 After Sanders wrapped up his fiery speech, it was clear that the cheering supporters were ready to caucus this Saturday.